Onscreen, actress-model Milla Jovovich has been many things: a dippy stoner-folkie, a pure-as-the-driven-snow Catholic martyr, a vigilant zombie-slayer. But in her latest film, the bleak, ruminative drama Stone, her character isn’t so easily defined. As Lucetta, a morally challenged free spirit whose husband (Edward Norton) prods her to convince his parole officer (Robert De Niro) to release him, she’s effervescent and dark, an innocent and a seductress. Reviews of Stone have been mixed, but they tend to praise Jovovich’s gutsy, unexpected dramatic turn. (This, just a month after Resident Evil: Afterlife, the fourth installment of the action franchise she carries, celebrated its biggest worldwide opening yet.) The A.V. Club caught up with the ebullient Jovovich to explain her unlikely career trajectory and how her latest role is possibly her most humbling. The A.V. Club: Your Stone character is fairly complicated. What’s your take on her? 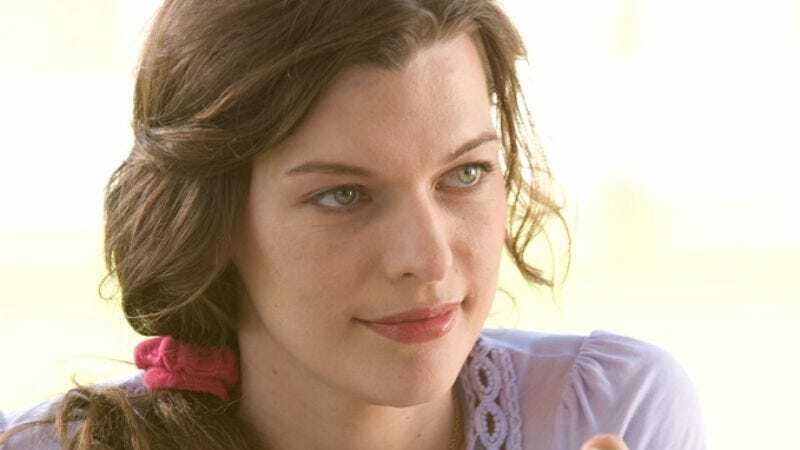 Milla Jovovich: My first take on her was that she’s kind of like this light in the script—very joyous and fun and tactile and wild and free—in comparison to the other personalities surrounding her, who are all sort of caged in their worlds. I was very attracted to that freedom she has. AVC: She kind of becomes her own beast. MJ: If you feel like you’re helping someone else, it helps you feel more in control of your world. She’s one of those people who needs to save people, whether it be Stone, who depends on her and who’s her lifeline, or Jack, who is also in a sense in his own prison. It gives her validation. She is a girl who with a bit of education and TLC could be an amazing personality. But because of the situation she finds herself in—where she lives and who she ends up being—she can’t break out of that rut. What’s interesting about the movie and characters is that they’re one thing to the world and another thing in their heads. AVC: You mentioned to a reporter that you felt violated after you filmed some scenes with De Niro, and that ended up all over the Internet. What did you mean? MJ: Well, not with Bob. No no no no. I felt violated after certain scenes in the movie. She’s a tough character. The choices she makes, especially her sexual choices… it was hard for me to put myself out there like that. It was hard not to feel violated, ’cause I have to go home after walking in these shoes all day. It plays a number on your head. Some days I came home and was really upset; it was hard to see the baby [Jovovich’s 2-year-old daughter]. AVC: You shot some of that movie in a real prison, right? MJ: Mmm-hmm. It was absolutely stifling. You walk in there, and it’s like dead air, dead space. It was very creepy for me to think that there are human beings spending life terms there. I couldn’t wait to get out at the end of the day. AVC: Did you actually see any prisoners? MJ: Not face to face—they could see me, but I couldn’t see them. Um, so it was actually really funny, because I would hear all these hoots and hollers from the prison. So I don’t know, I sorta did a little dance for them. They started cheering. I was like, “Oh my goodness!” and ran back inside. But there was a bit of joy and a bit of laughter. You feel choked inside there. You feel the ghosts of years past. AVC: Your part in this film is a girlfriend role without really being a girlfriend role. MJ: [Laughs.] What attracted me to A Perfect Getaway was that I sorta played a girlfriend role for, you know, 85 percent of the film. That was really interesting to me, because I’d never really played a girlfriend before. But I’ve always been attracted to characters that were interesting to me, and different. AVC: And you’ve finally done a comedy, Dirty Girl. When folks think of you doing comedy, they generally go back to Dazed And Confused. MJ: Unfortunately, the small comedies I’ve done have hardly seen the light of day, which is kinda sad. Dirty Girl was a lot of fun, and I’m so glad it got picked up in Toronto. People really liked it! AVC: You’re predominantly known for action—Resident Evil, Ultraviolet, The Fifth Element. Did you intentionally go that route to dispel the stereotype of the waifish, weak model? MJ: You know, not really. I’m 34. I grew up with Thundercats and She-Ra: Princess Of Power. That was sort of my take on fantasy: the women after-school cartoon world. And that was the action figure I was playing with. I grew up having this fantasy of being a superhero, being Princess Power. MJ: I never looked at it like that before. What made it real to me was that it was something I really loved. I love the training, learning the stunts, doing them. I love feeling that power—doing things you could never actually do in life—like flying and doing backflips in the air! Like, I came over on a plane yesterday, and one the two movies I chose to watch were The Karate Kid [remake] and The Last Airbender, which I thought was awesome. AVC: The M. Night Shyamalan movie? MJ: The action sequences were so good, and that little boy killed me. And I was all, like, in airbending mode the whole car ride home. I can’t help it. I love martial-arts movies. I grew up with my dad watching kung-fu theater every Sunday. So it was kind of my thing. I really want my agent to make sure they write a part in the next Airbender movie for me. I’ll be really upset if I don’t get to be a waterbender or something. AVC: To what extent do you leverage your success in action films to take on indie roles? MJ: As much as I enjoy doing Resident Evil—and I’m so grateful that this movie, fourth in the franchise, has done better than any of the ones before—the fact that I can get movies made that I wanna make…it gives me the opportunity to do things like Dirty Girl. And I did a film [about a con-artist mom and son] called Bringing Up Bobby that Famke Janssen wrote and directed. No one’s gonna hire me for their [big-budget] romantic comedy, so it’s up to me to look out for great indie comedies and show people a different side of myself—even if it’s for three people outside of my family. [Laughs.] Whatever. It builds a body of work. At the end of it all, it’s my little movie library, and you see aspects of me through that.